an architecture: How Dangerous is Nuclear Power really? How Dangerous is Nuclear Power really? By change, Austria is free from nuclear energy. In the 1978 referendum the Austrian population voted against the AKW Zwendendorf (50.5% of voters said no) - a fully functional power plant located 38 kilometer to the west of Vienna. 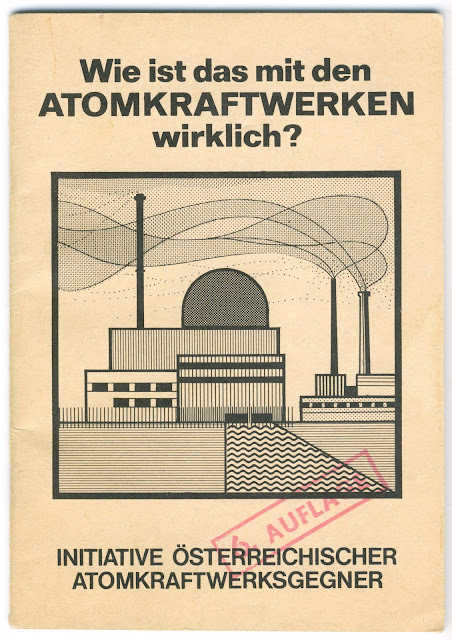 In 1976, the Austrian anti-nuclear movement published a little booklet to inform people about the risks of nuclear energy. It is astonishing, however, how clear the movement has already been about the threats of nuclear plants - facts, were nuclear campaigners still look away. 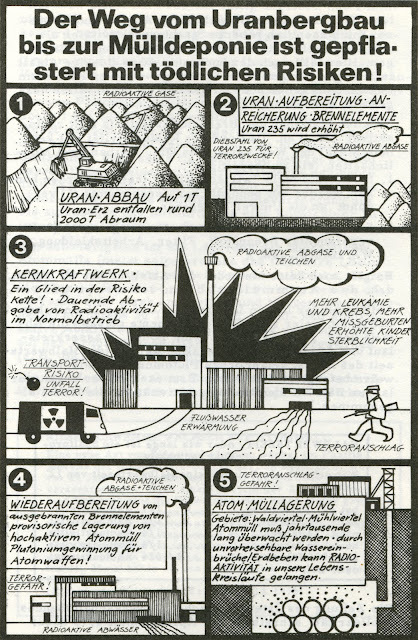 The 1976 graphic explains #1 the problems of uranium mining (emission of gas, 1 ton of uranium causes 2000 ton of excavated material), #2 the threats of isotope separation, #3 the danger of operating a nuclear power plant (transportation, terroristic attacks, accidents, emission, ..), #4 nuclear reprocessing and finally #5 the problem of nuclear waste. Crazy, 35 years later, we are still no step ahead in the matter.